This $10.5 billion company is a leader in a growing industry, its stock has crushed the market over the long term, and it has plenty of room for growth. There are several consumer goods stocks that look very promising for 2017 and beyond. Disney (NYSE:DIS) is one of my very top favorites, but nearly all investors are familiar with the stock. So, I'd like to highlight a consumer goods stock that isn't as well-known as Disney -- but has very close ties to it -- that has crushed the broader market over the long term and has plenty of room for growth: toy maker Hasbro (NASDAQ:HAS). Hasbro has significantly outperformed the broader market and prime rival Mattel over the long term. Data by YCharts. Here are seven reasons investors should consider adding Hasbro stock to their holiday shopping lists. The global toy industry continues to grow, which is providing a tailwind for Rhode Island-based Hasbro. In 2016, the industry grew year-over-year revenue by about 6% through August, Hasbro CEO Brian Goldner said on the company's third-quarter earnings call. Given the ballooning middle class in China and some other emerging markets, the global toy industry's future looks bright. Along with privately held Lego Group, just two public companies dominate the toy industry: Hasbro and Mattel (NASDAQ:MAT). 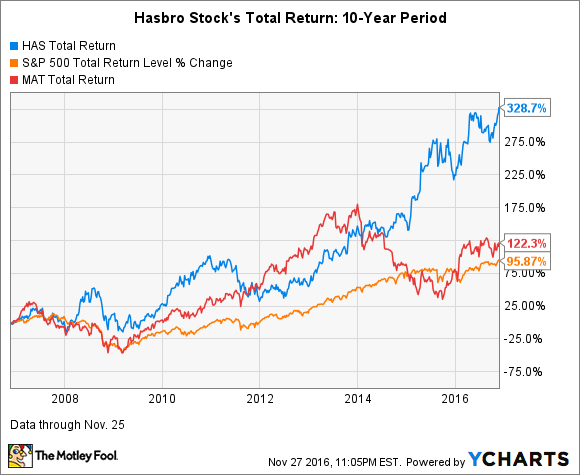 Hasbro's stock performance has been knocking the pink socks off Barbie and her corporate parent, Mattel, over the long term, as the chart above shows. Mattel has been making solid progress this year in its turnaround efforts, thanks largely to its still-nascent reinvigoration of its Barbie brand. Nonetheless, Hasbro remains the better bet for the long run, in my opinion. It has better bench strength among its internal brands and closer ties to the mighty Disney. Moreover, it has stable top-notch leadership: Goldner, who has led the company since 2008, is largely credited for transforming Hasbro into a character-based multimedia company. Hasbro's seven franchise brands -- its key internal brands -- are well-loved names: Nerf, Play-Doh, Monopoly, Littlest Pet Shop, Magic: The Gathering, My Little Pony, and Transformers. Nerf and Play-Doh have been the superstars among these brands, consistently posting quarterly year-over-year revenue increases in the double digits. Year-over-year revenue for franchise brands declined 2% in 2015, but grew 31% and 15% in 2014 and 2013, respectively. Last year's revenue growth was negatively impacted by currency headwinds and tough year-over-year comparables for select brands. In constant currency, franchise brand revenue rose 7% in 2015, and it's been increasing to date in 2016. Looking ahead, Hasbro has some significant catalysts for growth in its franchise brands. Notably, 2017 will be the first year since 2014 that there's a planned major movie release based on the Transformers. Also coming next year is a movie based on My Little Pony. Franchise brands accounted for 52% of Hasbro's total revenue in 2015. The remainder of revenue is generated from challenger brands (internal brands the company believes have the potential to become franchise brands over time, including Baby Alive and preschool brand Playskool), mega gaming brands (The Game of Life, Scrabble, Trivial Pursuit, and several others), other internal brands, and partner brands. Hasbro's partner brands -- which are those licensed brands for which it develops products -- are Star Wars, Marvel, Disney Descendants, Jurassic World, Sesame Street, Disney Princess, and Frozen. (The Jurassic World license from Comcast's Universal Studios will transition from Hasbro to Mattel in July 2017. Goldner said on the last earnings call that this line generates approximately $100 million in a movie year.) As you can see, Hasbro enjoys close ties with Disney: Star Wars, Marvel, Disney Descendants, Disney Princess, and Frozen are all owned by The House of Mouse. Hasbro's ties to Disney tightened in 2016, when it was awarded the license -- previously held by Mattel -- to make dolls based on Disney Princess characters and the immensely popular Frozen movie. This award was a big coup, as Mattel's gross sales for this line in 2015 were about $450 million, equivalent to about 10% of Hasbro's revenue last year. Hasbro has been expanding the line, so investors should expect some solid growth in 2016 and going forward. In addition to Star Wars-related catalysts -- covered in the next section -- catalysts for growth on the near-term horizon include the planned release of three Marvel movies in 2017 that promise to be box-office hits: Guardians of the Galaxy Vol. 2, Spider-Man: Homecoming, and Thor: Ragnarok. Hasbro's Star Wars license from Disney has proved golden. Star Wars-based toys added approximately $500 million to Hasbro's coffers in 2015 -- about 11% of its total revenue last year -- thanks to last December's megablockbuster Star Wars: The Force Awakens. Hasbro should be a huge winner again this holiday season, thanks to the Dec. 16 release of Rogue One, a stand-alone Star Wars movie. Goldner said on the third-quarter earnings call that the company continues to expect that Star Wars revenue for 2016 will be roughly in line with its revenue the previous year. Additionally, there are three more Star Wars films in the pipeline for the next few years: two to complete the trilogy that began with The Force Awakens and another stand-alone film. Hasbro has been investing significantly in the digital space -- heavily in mobile gaming -- which is a necessity in today's world, where many kids and adults are hooked to their electronic gadgets. Some examples: In early November, Backflip Studios launched an all-new mobile game, DraganonVale World, which is its first major release since Hasbro took a 70% stake in the studio. Through the last earnings call in mid-October, one of the company's newest games, Speak Out, had generated more than 100 million online views. Hasbro's financial performance reflects its strong points previously discussed. Notably, Hasbro's operating and profit margins are expanding, as both have been growing significantly faster than revenue. Analysts expect Hasbro to grow earnings per share at an average annual rate of 11.4% over the next five years. Given the company regularly beats Wall Streets' quarterly estimates -- it's three-for-three in 2016, with two of them being big beats -- there's every reason to believe this projected long-term growth rate could prove too conservative. The stock -- which pays a decent dividend currently yielding 2.4% -- is reasonably valued with a forward price-to-earnings ratio of 19.1. All these things together make Hasbro the best consumer goods stock for 2017.